At Carrick Design we are committed to providing our clients with great service and outstanding value. Throughout the entire design process our team focuses on delivering client goals by developing creative design solutions that unlock the full potential that each new project and landscape present. Our clients benefit from the specialized knowledge and experience we have gained since 1985, on numerous projects worldwide. Our history is demonstrative of technical excellence and reliability. Our design team is extremely versatile and adept at dealing with mountainous settings, flat sites, rocky terrain, poorly drained sites, environmentally sensitive sites and irregularly shaped properties. Carrick Design Inc. has built its’ reputation on consistently producing extraordinary golf courses on even the most challenging terrain. Design is a process that evolves throughout the life of a project. It also evolves over time with each new experience gained on a variety of different projects. Every new project presents new challenges and circumstances that require a different design approach from previous projects. Every site has unique physical characteristics whether it be the topography, the soil, the vegetation or environmental constraints. Each new client has a different set of requirements or goals. Every locale employs a regulatory process that meets their specific vision for their community. All of these factors influence the design approach required to complete a project successfully. The design process requires both rational or analytical thought as well as an intuitive sense. The rational or analytical side of design involves gathering information about the site, along with the client’s requirements and devising a plan that fits those requirements into the physical aspects of the site. Or as the old saying goes, “form follows function”. The intuitive side of design is a lot like painting or sculpting, where the final form is not known until it is completed. In some cases there is no rational reason for designing something in a particular way, other than to say it “feels” right or “looks good”. Many times the design process involves a little bit of experimentation, until the ultimate design solution is arrived at. Design is a process of continual learning and experimentation that we draw upon to deliver creative design solutions that exceed our client’s expectations. The first step in the design process is focused on gaining insight into our client’s vision or goals for the project along with gathering pertinent information about the site characteristics, project potential and marketplace positioning. The second step in the design process involves exploring different options for the layout of the golf course, including all ancillary facilities and / or surrounding development, in accordance with our client’s requirements. We are sensitive to the magnitude of our client’s investment in the project and strive to use the land efficiently in order to develop a design solution that maximizes the value and overall potential for the project. 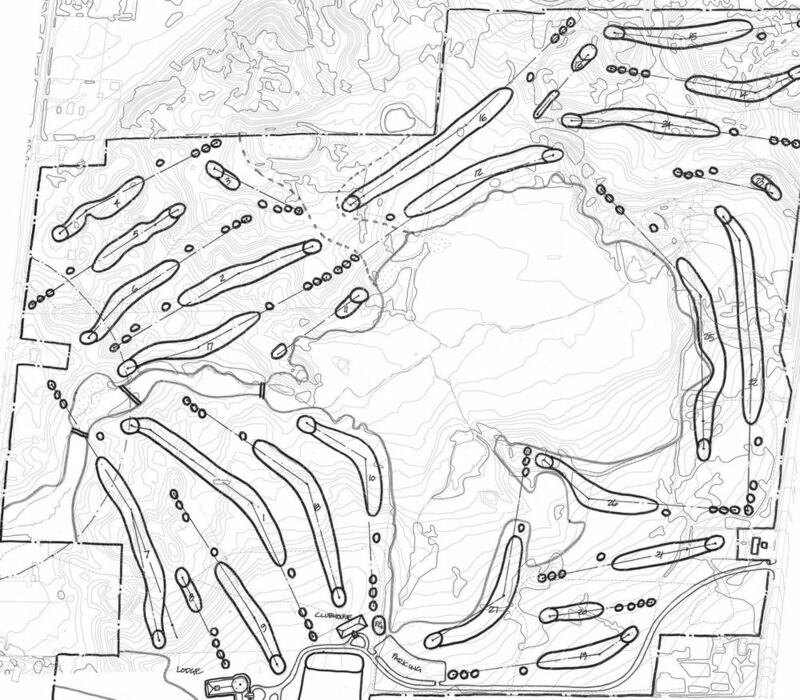 Laying out (or routing) the golf course is the most important phase of designing a golf course. The routing should take full advantage of the natural features of the site, maximizing the experiential potential it has to offer while balancing the technical objectives for par, yardage and flow. Every golf hole should blend seamlessly into the landscape while presenting golfers of all skill levels with a variety of interesting shots, challenges and visual experiences. It is also important for the layout to have an easy flow or direct connection from one hole to the next, in order to allow golfers to easily navigate their way around the course without confusion or long walks between holes. The initial layout of a golf course is the skeleton on which the body of the course is built. The third step in the design process is devoted to advancing the conceptual design with details that illustrate the character of the eventual development. At this stage fairways, greens, tees, bunkers and ponds are defined in greater detail. 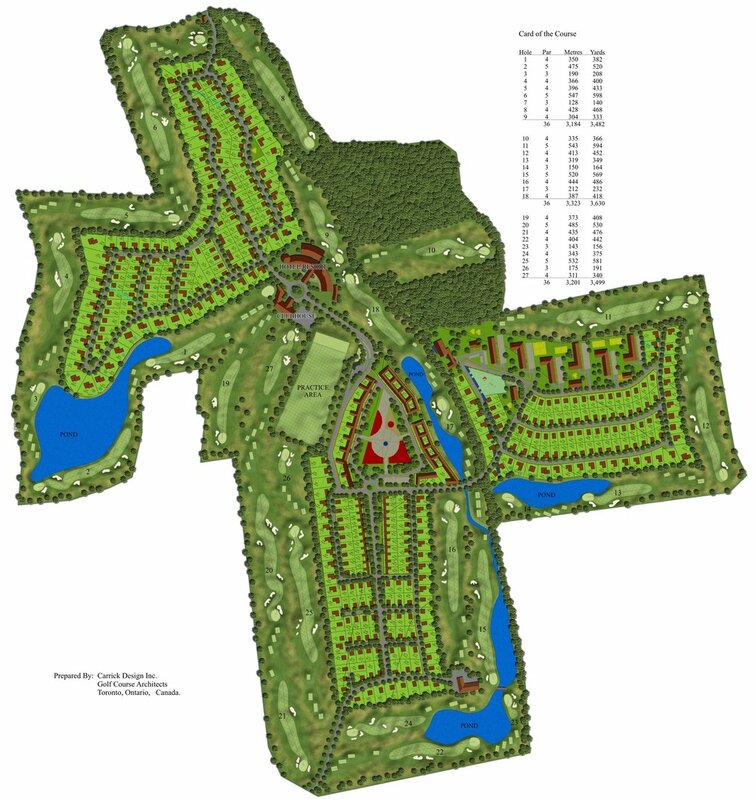 Roads, residential lots, the clubhouse site, hotel sites and / or other ancillary facilities are incorporated into the overall Master Plan. Colour CADD drawings are skillfully rendered for presentations to investors and government agencies. The detailed design phase is when the character and personality of the golf course begins to take shape. The form and dimensions of various golf course features including greens, tees, bunkers, fairways, ponds and cart paths are defined in greater detail, once the overall layout of the golf course is determined. The elevations of greens, tees and fairways are established to help determine the quantity of earth to be moved, drainage patterns are established to ensure efficient movement of water off playing surfaces following heavy rain storms and landforms are designed to enhance the visual character and playability of the golf course. Underground drainage and irrigation systems are designed to complement the various features and functionality of the golf course. Grass species are selected for greens, tees, fairways and rough areas based on their ability to provide optimum playing conditions for the particular climate and soil conditions they will be growing in. Quantities of tree removal, topsoil stripping, earthmoving, greens construction, tee construction, bunker sand, drainage & irrigation pipe, seed and sod are measured to establish the overall cost to build the golf course. The design and preparation of grading plans for the golf course helps to reinforce the design strategy for each hole and establishes the design character and personality of the course. All drawings are provided in CADD to ensure accurate quantity estimates and to provide for easy transferring of digital files to our client and to other project consultants. The construction phase is when the golf course design is fine tuned into its final form. 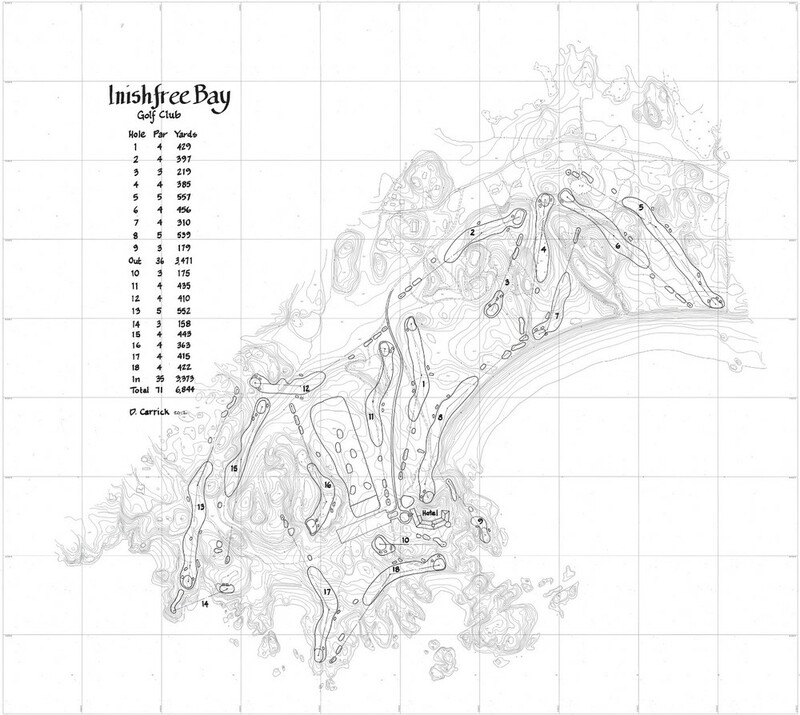 The routing of holes and the location of tees, greens and fairways typically do not change to any significant degree from the plans, although there are occasions when the design can be improved or enhanced by altering the location of a green or tee once the layout is staked in the field. Once the final location of the primary golf course features are established in the field, the shaping and molding of the course is fine - tuned with the softening, sharpening and accenting of slopes where necessary, to blend the design into the natural features of the site. The Carrick Design team dedicates countless hours to regular on site supervision during construction, to provide a finished product of the highest quality. It also allows us to closely monitor construction progress and construction costs to ensure that the project is delivered on time and on budget. Other services provided during this stage include, processing of payment certificates and change orders.